I took two years out of education following sixth form; in the first year I completed an apprenticeship in Business so I went to college once a week whilst working at a post-production company in the sales department. I was responsible for compiling board papers, creating meeting minutes and forecasting. In the second year I moved on to interviewing young people for apprenticeships and working as a receptionist for a social enterprise. In this role I was required to provide excellent customer service and organise monthly events for the community. During these two years I was also involved in charity work, raising awareness for food banks and collecting donations. The main feature that appealed to me about studying Speech and Language Therapy at City was the location. Being the sole provider for the undergraduate course in London, the university has strong links with healthcare setting all over London, allowing me to expand my knowledge of the course by working with a diverse range of clients. City also has an excellent reputation for teaching and clinical training. Speaking to current students, and students who had graduated from this course many years ago were able to provide me with great insight. Another great aid were the league tables, which indicated high levels of student satisfaction and employment rates for this course. 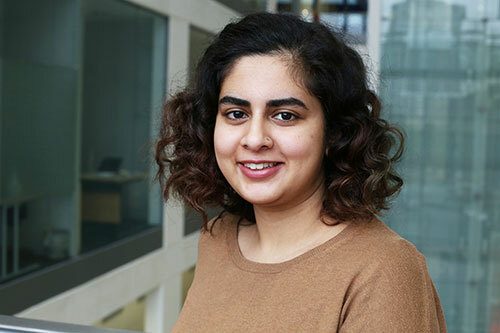 I am a student ambassador, so I proudly represent my university at HE fairs and when prospective students come to the university I am able to show them what amazing facilities we have to offer. Additionally, I am part of the Widening Participation team, which look to contribute to a fairer society by tackling barriers to Higher Education through activities such as tutoring and open days. The university is great at providing students with part time work opportunities that fit in student timetables. After graduation I aim to jump right in and look for employment as a qualified Speech and Language Therapist. I am unsure about which client group to work with, however my placements at the university will definitely guide me to make that decision. Look forward to the challenge!